This Bible Moralisée preserved in the Österreichische Nationalbibliothek in Vienna, is a colorful collection of miniatures representing biblical scenes. 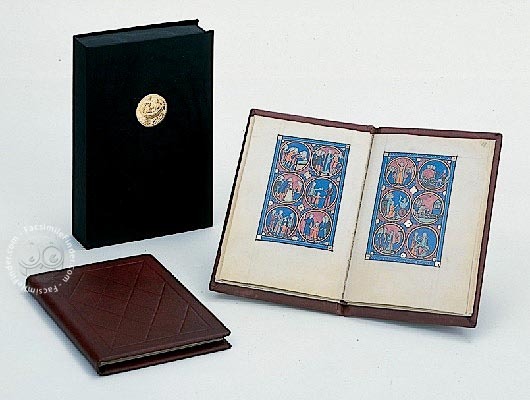 Made in France in the thirteenth century, this manuscript reflects the arts of the time by evoking the colorful stained glass windows characteristic of the Gothic style. 84 scenes from the Old and New Testament are organized in paired medallions. 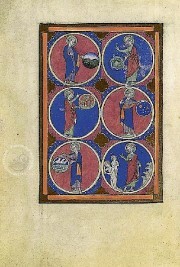 Elongated figures typical of the Gothic style are set on blue and red backgrounds. Detailed images rendered in gold and bright colors are representative of the thirteenth-century France illumination. 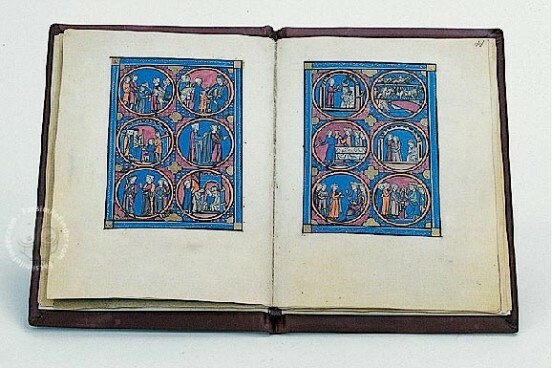 The layout of the pages is original for the pictures completely replace the text of the Bible, which traditionally appears in a very concise and explicative format in the Bible Moralisée. The illuminations represent selected scenes of the Bible constructing an elaborate narrative. The recount of the Holy Writ begins with the six days of Creation with the figure of the Creator holding images of the created things including light, water, animals and Adam and Eve. The Old Testament cycle represents the Book of Genesis up to the story of Joseph. 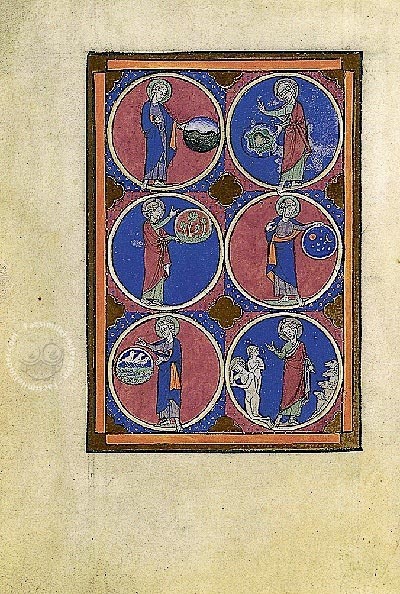 The popular story of Joseph receives the illuminator’s special attention as it covers five plates of the book. The New Testament shows the birth of Christ with the representation of the Annunciation, the Nativity and the Infancy of Christ. The narrative of the New Testament extends to the salvific images of the Resurrection and the Last Judgment. Manuscript book on parchment − 17.5 × 13.2 cm − 44 pp. Full-size color reproduction of the entire original document, Gothic Picture Bible: the facsimile attempts to replicate the look-and-feel and physical features of the original document; pages are trimmed according to the original format; the binding might not be consistent with the current document binding. Bordeaux red leather binding with blind tooling.